This guide will provide a critical overview of two popular front-end web development tools - React and Angular 2. The tools will be evaluated based on their approaches to building application structure, adoption by the community, performance, and ability to integrate with different platforms. The goal of this guide is to highlight core differences and understand the similarities between the two tools, thus facilitating the decision-making process when it comes to choosing which tool is appropriate for a given project specification. Services - Injectable elements that are used to consume data from an API or share state between multiple components. Components - Building blocks of the user interface that consume services. Can be nested inside each other through structural directive selectors. Directives - Divided into structural and attribute directives. Structural directives (ex. \*ngFor) manipulate the DOM (Document Object Model) while attribute directives are part of elements and control their style and state. Pipes - Used to format how data is displayed in the view layer. Modules - Exportable blocks of the application that isolate components, directives, pipes, services and routes together. React is far less rigid than Angular 2. It is a library that provides the most basic tools for building a web applications - a HTTP service and Components. There is no built-in router or anything that sets a particular convention. It is mostly up to the developer's choice what kind of packages he/she is going to use to shape the application. Using TypeScript makes setting up an Angular 2 application somehow tedious, as it introduces extra overhead for configuration. To get a clearer comparison between React and Angular 2's code strucures, we are going to compare how a basic TODO application is built (example apps built by Mark Volkmann (mvolkmann). Both applications use Webpack for development and deployment. In terms of application structure, both React and Angular 2 need two files - TodoList which represents the list of tasks and Todo which represents a single task. I've spotted the key differences between the tools using comments. // Used for type of state property in TodoListCmp class. // the code more maintainable. // under consideration to be included in ES2016. template:`  ` /*This is where the markup for the template can be put. super(); // must call before accessing "this"
As seen above, the creation process is quite similar for both tools, but React's is slightly shorter and appears to need less developer logic. (t: ITodo) => t.id === id ? //An Angular module can import functionalities from other modules and export some of its building blocks to other modules. //The module is bootstrapped, making the bootstrapped component the root //of the application if no routes are defined. // inside a specified DOM element. // easy comparison with the React render method. This uses a for loop to generate TodoCmps. #todo defines a variable to use within the loop. [todo] sets a property on each TodoCmp. on TodoListCmp with emitted values. deleteTodo receives a type of number. toggleDone receives a type of ITodo. <todo *ngFor="let todo of state.todos" [todo]="todo"
// to a variable and refer to it later. Angular 2 uses @Component decorators to specify the different constructs (services, directives, pipes) that it contains and to define its own properties. It also lets the developer specify a selector for the component and put the code for the template using the template property or the templateUrl if a separate file is used. The same applies for styles - there is an option to input styles directly using the styles property or to include an array of files using styleUrls. React does not have an analog for a component decorator and requires the template of the component to be included in the component file itself, thus limiting the options for customization and making the information about a component harder to interpret. * denotes a directive that manipulates the DOM. For example, *ngFor iterates over an array of values and creates a new element for each. *ngIf is used to denote whether an element can be seen or not. denotes a property binding, indicating that the element receives a value from the component. It is used mostly to pass data to a child component to the parent. () indicates an event binding (such as (click), which triggers a function in the components. [()] indicates two-way binding, meaning that any changes to the data that are passed will be propagated. // initialization values from the containing component. // publish values to the containing component. // There are three ways to define React components. // which only receives data through "props". // Optional validation of props object. Because it is the main building block of a React application, the component offers greater flexibility in the way it can be structured. Stateless components are built with one-directional data flow in mind, leaving the majority of the logic to stay outside of the component itself. Angular 2 also offers similar functionality, but it does it with more complexity. 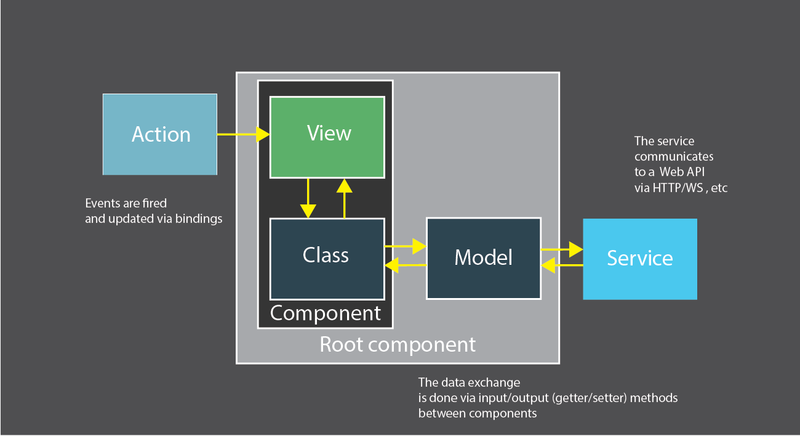 Angular 2 is using the standard bi-directional data flow model. Once an action is made, the data goes up to the service layer, then it goes back to the view. This way of manipulating data has been widely criticised because the state of the data can be changed both ways, resulting in inconsistencies. React uses Flux to construct its applications. Each action is sent to a dispatcher, which sends the new information to stores. The stores then update (mutate) the information and send it down to the views (controller-views), which listen for changes. Redux is the cool kid on the block. Like Flux, it is based on one-directional data flow, but it manages the data in a different way. An application that uses Redux has a global state that is shared among the whole application. 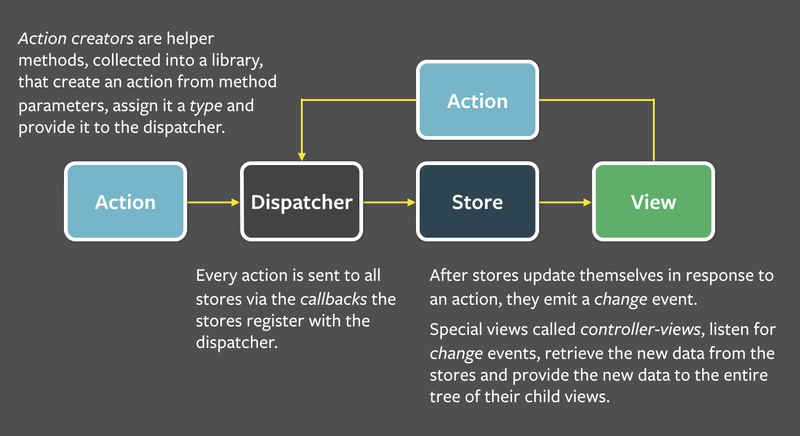 When an action is made, it is sent to a dispatcher, which serves to make a HTTP call to the API. Then, the changes are sent to reducers - pure functions that specialize in managing a part of the global application state. For example, if your application has users, projects and items as models, each of the models will be part of the global state and there will be a set of reducers that take care of managing their state. Once the state is 'mutated' by the reducers, the new information is sent down to the view. In this way, state of the application is kept in one place, providing for an easier state management. Redux was first introduced for React as an alternative to simplify Flux. Because of that, Redux is more widely adopted in the React community. Recently, Angular 2 has started adopting the Redux pattern for data flow by utilizing rxjs's observables to maintain the state of the data and using pure functions to manipulate it. Attemps have been made to build unidirectional data flow in Angular 2 applications, but the adoption of this technique is still low. Performance is another critical point of comparison. It shows how Angular 2 and React handle under heavy load and gives predictions for future problems as the applications become bulkier and more difficult to optimize. Both Angular 2 and React are seem on par, with Angular 2 having a slight advantage on all DOM manipulations except for creating new elements. In terms of memory management, React outperforms Angular 2 by using less memory, especially after page load. This is mainly due to the fact that React itself is smaller-sized than Angular 2. The cross-platform development world has made a huge leaps since the massive adoption of mobile devices. Now, WebView-based tools for building cross-platform mobile applications are obsolete. NativeScript, built by Telerik (now Progress), is intended to enable native mobile applications to be built with Angular 2. Even though it has only 8k stars on Github, NativeScript is mature and comes with great documentation and numerous extensions. It preaches a "write once, run everywhere" methodology of developing cross-platform applications. Even though this is an efficient approach, it does not enable devleopers to use many platform-specific UI features. On the other hand, React Native, developed by Facebook, gives React native capabilities. Compared to NativeScript, React Native is still young but quite popular and maturing quickly, boasting over 37k stars on GitHub. React Native uses a "learn once, write anywhere" approach to developing cross-platform applications. Instead of attempting to generalize different platforms like NativeScript does, Rect Native embraces their differences, offering different ways to construct UI for the different platforms. Recently, the Angular 2 team has started adopting React Native, making a renderer for it. React, on the other hand, is over 53K stars on Github. There are 95, 500 repositories containing the word "react" in them, roughly over nine times more than what Angular 2 has. Still, one of the big reasons for the large number of repositories is that React comes with just a few built-in functionalities and relies on its community to provide it with the needed tooling to develop full-scale applications. Both Angular 2 and React have large communities and boast corporate backing. Even though they have different philosophies to how an application development must be approached, there is a place for both of them in the software development world.